All university and training costs are included as part of this programme, as well as a generous salary of £19,899.75 - £22,961.25. When? 10am on the 11th May. Where? The Lingen Davies Centre, Royal Shrewsbury Hospital. This is a chance to meet the team and ask any questions you might have about the course. Interested in attending? Contact John on 01743 261302 or email john.macmillan1@nhs.net . We are looking for a dedicated individual to partake in this 3-year Healthcare Science (Radiation Engineering) Level 6 degree training programme. The successful candidate will be expected to have a logical and practical approach to problem-solving, good communication skills, willingness for continuous learning and development and an interest in electronic/mechanical engineering and IT. 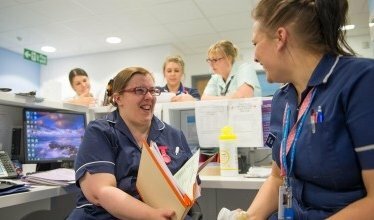 The NHS is a nationally well-respected employer, providing you with a superior stepping stone to your working life and future career. Candidates who are successful in their Apprenticeship and are shown to live our Trust Values are likely to be offered a permanent position within the Trust at the end of their Apprenticeship. Click here to find out more, and please share with anyone you think might be interested.